“The contemporary pro-independence movement with Marxist roots in the Països Catalans [Països Catalans is a political term mostly referring to Catalan-speaking regions– which the communists tend to stretch] was founded in 1969 from two fundamental sources: the revolutionary and anti-imperialist movements from around the world and the Catalan Marxism from the 1930s. Both sources have a common root: the October Revolution 1917 [Bolsheviks] and its consequences.”— from Poble Lliure International, Number 2, April 2017. The Catalan independence movement, through its illegal referendum and through all its manifestations– is communism in action. As such, it has nothing to do with freedom, democracy or respect for the rule of law. Let me say this again: The Catalan independence movement, through its illegal referendum and through all its manifestations– is communism in action. As such, it has nothing to do with freedom, democracy or respect for the rule of law. 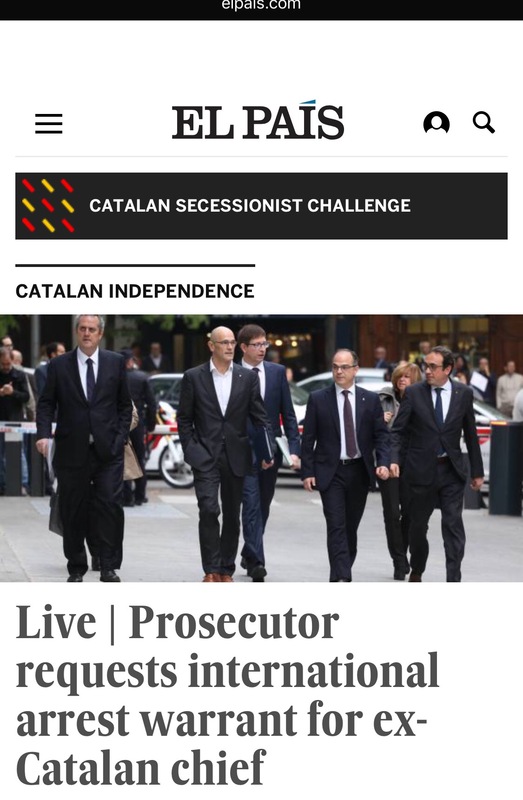 And you should be concerned, because the Catalan independence movement, made up of several parties and thousands of representatives throughout the world (yes, many are inside the United States) is a network of activists who seek to establish a communist state in Catalonia– even though they claim to be pacifists and democratic. This claim to pacifism and democracy is mendacity and hypocrisy of the highest level– because communists ALWAYS lie. It is impossible to support the Catalan independence movement without supporting communist groups– because they are in control. Catalans that tell you otherwise are lying or half-baked, regardless of the fact that they may have a PhD behind their name. One of the communist groups active in the Catalan independence movement is Catalunya Sí Que Es Pot (which means Yes, Catalonia Can). One of its representatives is Joan Josep Nuet, who in 1986 joined the Partit dels i les Comunistes de Catalunya (Party of the Communists of Catalonia)-– which as of November 1, 2017 will be known as Communistes de Catalunya (Communists of Catalonia). And the very Communist Mr. Nuet is also a member of the Catalan Parliament. These communists are not hiding– they operate out in the open. Mr. Nuet traveled to Mexico earlier this year to obtain an endorsement of the illegal Catalan independence referendum from several Communist parties. This endorsement was executed in a document published in Catalan, English, Spanish and French titled, “The international left-wing parties, in favour of the self-determination for the Catalan people”–and published in the communist bulletin Poble Lliure (Free People), which is the propaganda arm of the CUP Party, another communist front. Imagine that… “free people”– tell that to the people of Cuba, North Korea, China, Vietnam, Laos, Venezuela– and anywhere else communism takes root! The document endorsing the Catalan illegal independence referendum was signed by the delegates of the Communist Parties of China, Cuba, Laos and Vietman, as well as by some members of the Uruguayan Broad Front, the Sandinista National Liberation Front of Nicaragua and the FMLN of El Salvador, as well as some Bolivarian groups from Venezuela, Bolivia and Ecuador. Subsequently, talks were held with Die Linke, the largest organization of the German left, and with the Red-Green Alliance of Denmark, who also signed the document. What is most offensive is that Mr. Nuet has been able to openly undermine the Constitution of Spain through his communist activities in support of illegal Catalan independence– and has done so in spite of the warnings from the Constitutional Tribunal. “The construction of the Catalan republic is the key element of the democratic rupture with the Spanish State, heir of the Franco regime, and a step forward in the empowerment of the people of the South of Europe facing the kidnapping of the democracy in the hands of the elites. With the moral authority of a people that has always been on the side of the progressive forces, in Nicaragua and Euskal Herria, in Cuba and in Palestine or in Kurdistan, we welcome the signs of solidarity and we call revolutionaries around the world to reinforce our project for an independent, radically democratic and socially progressive society. The contemporary pro-independence movement with Marxist roots in the Països Catalans was founded in 1969 from two fundamental sources: the revolutionary and anti-imperialist movements from around the world and the Catalan Marxism from the 1930s. Both sources have a common root: the October Revolution 1917 [Bolsheviks] and its consequences. So, there you have it. The next time you meet someone who supports the Catalan “independence” movement tell them that you know the truth behind it. And if they don’t, teach them before it’s too late, because Catalonia’s “independence” is the current model of what communists have in store worldwide. Catalonia, Cataluña, Communism, Comunismo, Cuba, China, Laos, Vietnam, Venezuela.